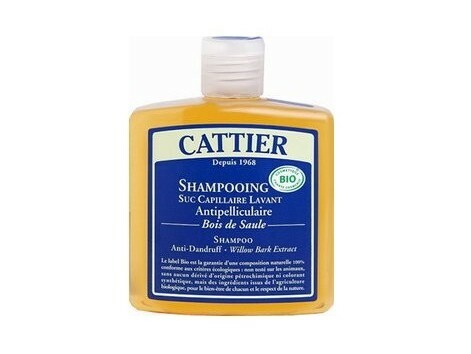 Cattier Shampoo Antidandruff-Willow Wood and Lavender 250 ml. Shampoo Antidandruff-Willow Wood and Lavender 250 ml. Cattier. Sauce with wood and lavender essential oil Overview: The antidandruff shampoo with a durable, remove dandruff and prevent irritation. Invigorates the scalp, and calm returns to its natural balance. With its formula enriched with protein wheat, feeds and strengthens the hair thereby facilitating their disentangled. The selection of essential oils provides a delicate flavor. Endorsement: Ecocert-BIO Active ingredients: Lavender floral water *: purifying aliviante Wood sage extract (rich in salicylic acid): antidandruff, regenerant, antimicrobio, protector, not irritating. Vinegar plants (lavender, rosemary, thyme, sage): soothing, antioxidant, anti-inflammatory, protective. Wheat proteins: nutrition, safety, remedial softeners, antistatic. Glycerine (vegetable): smoothing, moisturizing. Peppermint essential oil soft: antiseptic, aliviante, refreshing. Essential oils of orange and orange soft: aliviante, nutritious. Essential oil of mandarin: regenerating, softening. Grapefruit essential oil: purifying stimulating. Essential oil of lemon: antiseptic, balance the secretion of sebum, astringent, tonic. Essential oil of Tea Tree *: soothing, astringent, anti-bacteria. Extract liquid natural conservative, antimicrobio. * cbc = controlled biological cultivation. Composition INCI: Aqua, Ammonium Lauryl Sulfate, Lavandula Angustifolia Extract *, Sodium Cocoamphoacetate.Vinegar.Glycerin, Rosmarinus Offii Leaf Extract, Salvia Officinalis Leaf Extract, Thymus Vulgaris Extract, Hydrolyzed Wheat Protein, Usnea Barbata, Phytic Acid, Hibiscus sabdariffa Flower Extract, Salix immigration, Mentha spicata, Citrus sinensis, Orange Dulcis, Citrus Reticula Blanco, Citrus Paradisi, Citrus limonum, Lactic Acid, Melaleuca alternifolia, Sodium Chloride * cbc = controlled biological cultivation. Tips: Apply to wet hair, massage gently until foaming. Allow a few moments. Rinse thoroughly with warm water.